Disclaimer: Electrical work can be very dangerous! I did this with nothing more than my wits and a few books on electricity. Only do this project if you are familiar with electrical safety! I take no responsibility for any electrical shocks, fire, or damaged equipment. 30 amps of 220v power is enough to cause serious injury and even death. That being said, I’ve run two of these at maximum capacity for the better part of year with no problems. Bitcoin mining is very power intensive. As the power of mining equipment increases, hobby miners are running out of household electrical capacity. I am going to show you how to easily gain access to thousands of watts of power in the average American household. 1. Dryer circuits in America are 30amp at 220v. This is enough capacity to run 6600 watts worth of equipment! That is 4x as much power available than the standard 15amp 110v circuit commonly used for household outlets. 2. The dryer circuit in a house always ends up at a preintalled outlet. This is in contrast to other dedicated 220v circuits often found in a house such as an oven, water heater, or air conditioner. These are usually directly wired to the house (no outlet). 3. The dryer outlet is usually in an out of the way location that works well for mining, such as a garage or laundry room. 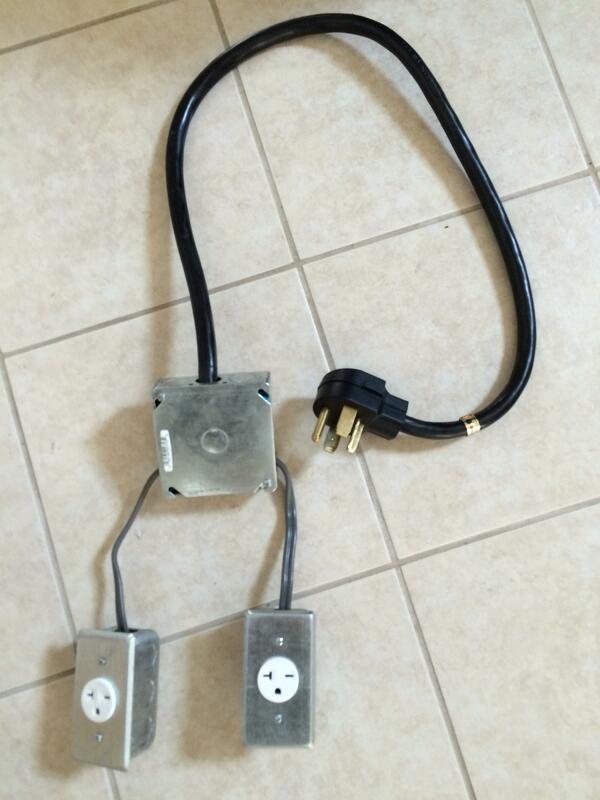 Note: Dryer replacement cords come in two varieties. There are three prong and four prong dryer cords. 3 prong cords are more commonly found in older homes. Newer homes are almost exclusively 4 prong cords. The 4th prong is a neutral wire that allows for simultaneous 220v and 110v power to come through the same cord. I did this project on a 4 prong cord. Since we won’t need this 4th neutral wire, I’ve simply capped it off. 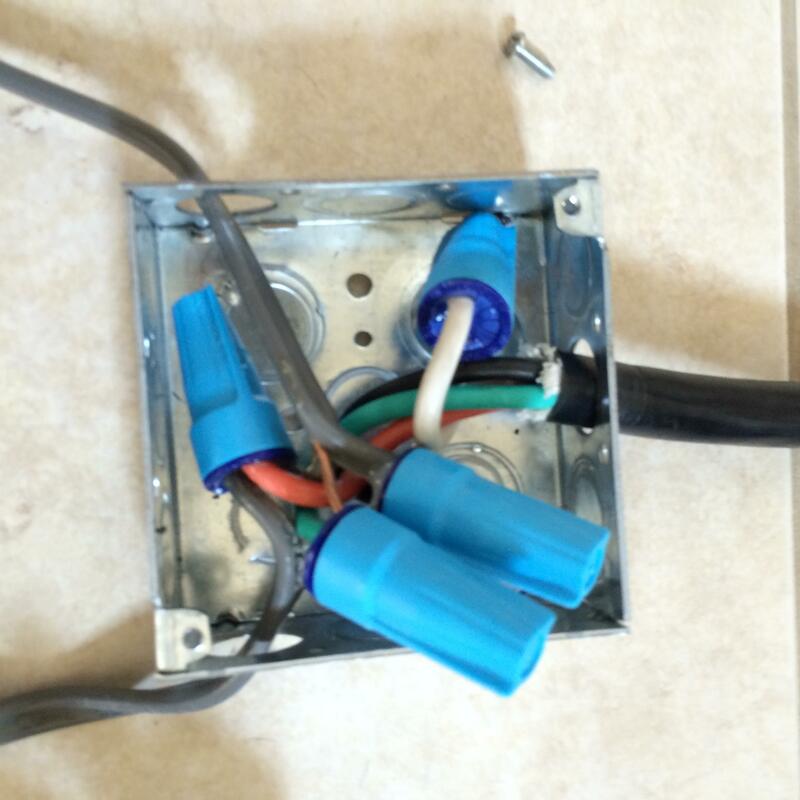 You can see this in the picture above as the single white wire going in to a blue cap. Dryer power cords end in a loop terminal at each wire for installation in to a dryer's power terminal. We wont be using these so cut them off and strip about half an inch of insulation off the end of each of the two hot leads (black and red) and the ground wire (green). For the white wire, DO cut of the loop terminal, but DO NOT strip the wire. First, take your 12 gauge romex wire and cut two 1 foot sections and strip half an inch off both ends of the cable. Second, wire up the outlets. Attach the bare wire (ground) to the green screw. Attach the white wire to the terminal screw on the same side as the ground. Attach the black wire to other side. A small pair of pliers will needed to wrap the wire around the screw terminals. Third, install the outlet into the handybox. Be sure to knock out one of the holes and thread the 1 foot section of cable through the hole. Install a faceplate for safety. Now you should have two outlets wired up and ready to be connected to the dryer’s cables. First, punch out 3 holes from the square junction box and insert the wire ends from the dryer plug and the two outlet boxes. Important: if you are using a 4 prong dryer cord like I am, now is a good time to cap off the WHITE wire from the dryer plug. 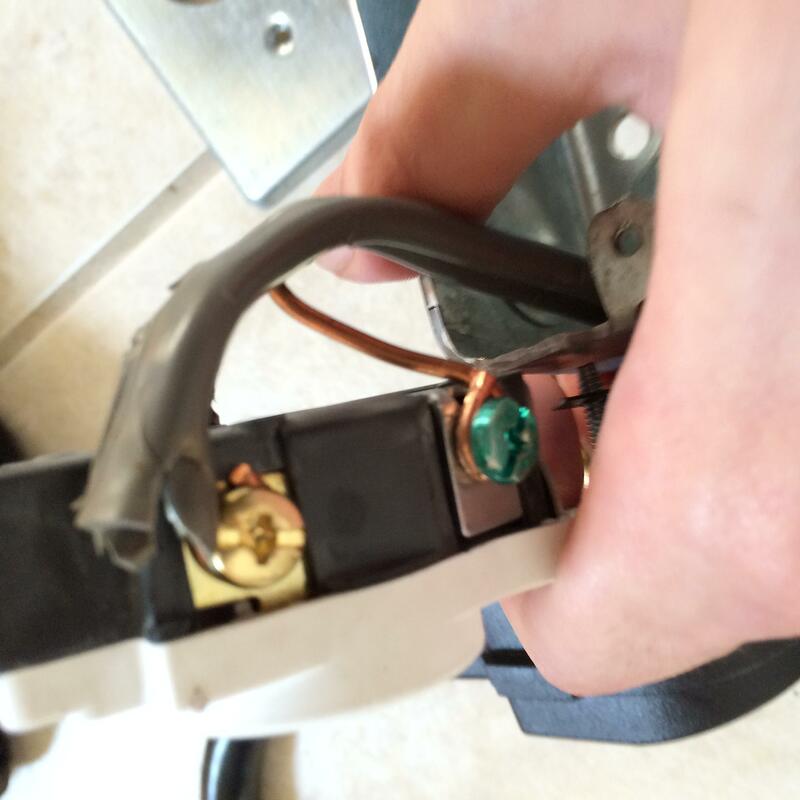 Second, connect the two bare ground wires from the outlets and the one green ground wire from the dryer plug. Third, connect the two white wires from the outlets to the one red wire from the dryer plug. Fourth, connect the two black wires from the outlets to the black wire from the dryer plug. Stuff everything down carefully and install the faceplate. You’re done! You can now power 6600 watts worth of mining equipment of a single, seldom used household outlet! Optional: install sections of conduit between the outlets and the junction box and a rubber O ring from where the dryer cord enters the junction box. This will prevent rubbing from sharp edges potentially damaging the wire insulation and causing a dangerous short. This would make this project more “to code”. Total Cost: Approx $50, depending on how much romex wire and tools you happen to have on hand. When trying the device for the first time, switch off the breaker at the breaker box and then plug in the cord. Then plug in a device that turns on when given power. I used a power supply with a shorted on switch. Then go back to your breaker box and flip the breaker to on. If everything is good, your device should turn on. If there is a problem, it won't, and you should turn off the breaker before touching anything. The dryer cord will provide 30amps at 220v. The outlets and romex wire are only rated for 20amps at 220v. This means you can safely run up to 4400 watts on a single outlet. I chose to limit usage to 3300 watts (15 amps) on each outlet. The main thing to keep in mind is total power draw should not exceed 6600 watts between both outlets, and each outlet should be kept under 4400 watts. Hope this was helpful! Happy mining! I am considering having these professionally manufactured for sale. I’ve researched this already and I can sell these cheaper than it takes to DIY from a hardware store. If there is enough interest, I’ll put in an order for them. Let me know! There are similar cords designed for RVs, yes, but they don't have multiple outlets nor do they have the right outlets. This is purpose built. Trust me, if i could have just grabbed that off the shelf, I would have. It must be right in the feels trying to power miners in the US. In the UK a socket is a socket, and more than likely its got a 32A (which is really 40A 24/7) 240V circuit behind it. Right in the feels is exactly how I would describe it. You can barely power a duel GPU workstation and some lights in a room before tripping a circuit. Ah if there are already ones out there, i would be interested to find them. While I made these to power S1s, I thought more people might be interested in them because of the huge power draw from single units such as with the SP30 (or 35, whatever). The 2500 watts needed will trip any standard household circuit in the US. 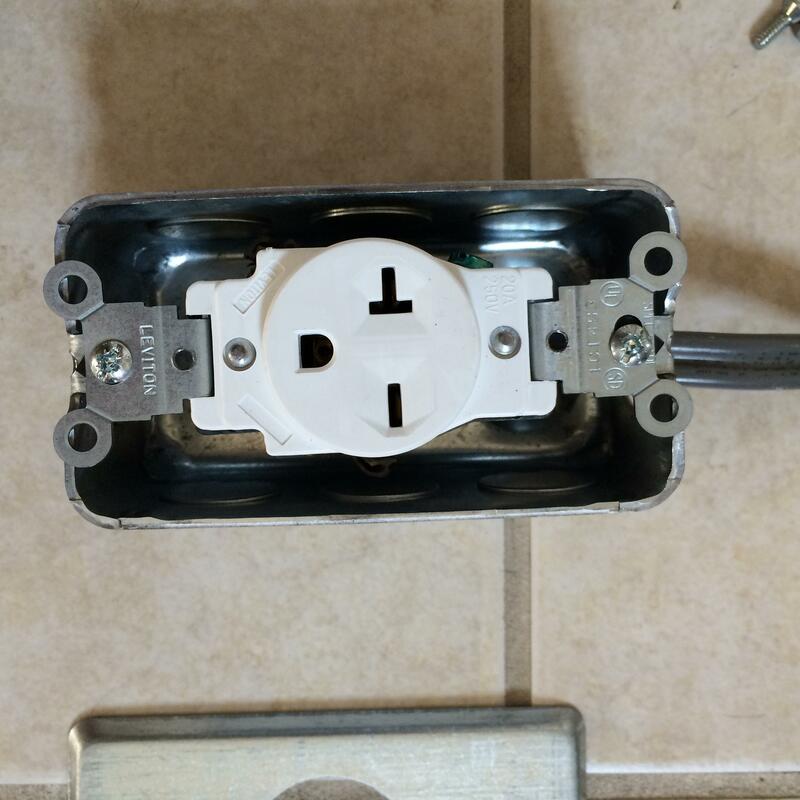 Also, I did the same thing as that other guy, at first I had an electrician convert the outlet to 4 220v outlets for a few hundred bucks. I believed I could do better. anyway sure someone will trip over this thread looking for a temp or perm fix and go "VIOLA!" anyway off topic...but the adapters are probably fine the surge protector is a big deal also get one imho. Nice job on your breakout box. I do have a few suggestions for you. 1. All metal boxes MUST be grounded. That means the lead from the dryer plug must be tied to the metal box as well as the two lines to the outlets. It's not a big deal, just screw a ground wire into the box and tie it into the other three grounds with a wingnut. 2. Always use strain release. Never have unsecured wires in the middle of a hole where they can wear on the edge of a hole. 3. The 12 gauge wire and 20 amp plugs are only rated at 20 amps. The dryer outlet is rated at 30. You can burn out the wire between your breakout box and the outlet box or the power cable from the outlet box to your equipment without the 30 amp breaker tripping. This may or may not exceed your tolerance for risk. 4. You can do everything in a single box if you get a deep one. 5. You will want to have 20 amp breakers protecting each of the 12 gauge wires if you build this for sale or your insurance company will disown you. If I were to do this project, I would probably buy something like http://www.ebay.com/itm/DELL-AP6031-5T439-4-Outlet-Rackmount-Server-220-240V-Power-Distribution-Unit-PDU-/371098052990?pt=US_Power_Distribution_Units&hash=item56672ae97e , cut off the plug and buy a dryer plug to replace the twisty plug. Disclaimer, I don't' know who that seller is, it is the cheapest "220v pdu" I found on ebay that looked like it would do the job. Good work on your project. It looks like you did a good job. Just please don't try to sell it without fixing a few safety issues. Not to mention in America it's required that you get a permit and have a license electrician do the work, this was if there is ever an electrical fire in your house due to your lack of getting a permit from the city and hiring an electrician your insurance company will walk away as they are not required by law to fix your house if you didn't follow the by-laws. I knew someone who did this and suffered dearly when their wiring shorted out causing a major fire. Once the fire marshal determined it was an electrical fire due to improper wiring the insurance company asked the home owner to see the permits on the house, when the saw there were no permits they walked away leaving the home owner empty handed and having to fix/rebuild their home. then again anything is better then 1920 wires so maybe he was just pleased at that! The way this is wired is a big no-no. Trip over one of the boxes, yank the wires right out of the plug, big house fire. We assume this is because you want to run computers or devices with a 220v power supply, which can be more efficient (and then go to the laundromat, I guess...) - under 5A per plug (not for plugging in four arc-welders.) The inside MUST be wired for each plug to deliver full 30A service - the breaker must blow before wires inside melt. If you want to draw large amounts of power in a home, you should see Tesla forums where people have paid electricians $2000-$8000 to upgrade their electrical box and systems to put 80A chargers for their cars. 2. Always use BTC Never have unsecured wires in the middle of a hole where they can wear on the edge of a hole. I think you mean strain relief. The rating of the wire depends primarily on the length - but yeah I wouldn't be using 12AWG. OP: I got electrocuted just by reading your post. Very entertaining.